1 of 3 Wrap whole-wheat pitas in foil; heat in a 350 degrees F oven for 15 minutes. 2 of 3 Meanwhile, drain jar of marinated roasted red peppers and chop into 1/2-inch pieces. Chop kalamata olives. 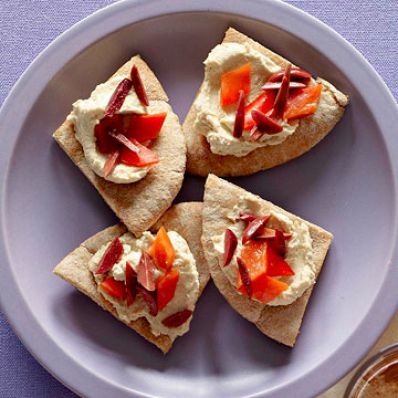 3 of 3 Spread each pita with a few tablespoons of lemon-flavored hummus, then top with red peppers and olives. Cut into wedges and serve.